We wish all our customers and providers a very happy Easter Holidays. Good Friday 19th - open reduced hours 9.30am - 1pm. Sunday 21st Closed as normal. Monday 22nd - open reduced hours 9.30am - 1pm. You can always leave messages on 01392 277727 or email us and we will respond ASAP. Just to let you know that the shop/showroom will be closed and on reduced hours opening on a few days late in April 2019. My apologies if this has inconvenienced you. Sat 27th & Mon 29th. Fri 26th & Tues 30th then normal hours from Wed 1st May. At Exeter Bathrooms and Kitchens we specialise in offering a broad range of bathroom and kitchen products at discounted prices. Our small outfit, market knowledge and reduced overheads means we get to pass on savings that would otherwise be unthinkable. Our service ranges from online or showroom product purchasing to a comprehensive bathroom and kitchen installation, beginning with a free consultation over coffee, progressing through to choosing products, accessories and layout, and finally producing a final result that sits perfectly with what you had envisioned. We offer a special selection of products to view at our Exeter showroom so that you can get a real-life impression of the look and a tangible experience of the feel - very important when deciding on appropriate floor tiles. 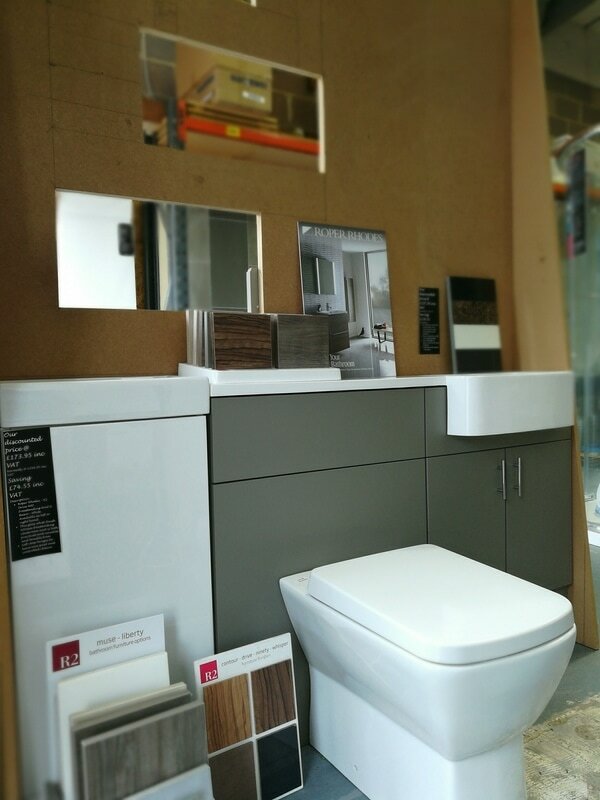 We are currently displaying the contemporary R2 bathroom furniture, which comes in various models. Supplying quality G.R.P. bath tubs and walk in showers for over ten years, specializing in innovative walk in baths and showers for the less able. Inclusive, Multi-User Healthcare Kitchens for All...we believe that every kitchen should be inclusive in design to suit all user needs and abilities, with an equal emphasis on function, style and affordability. Our installation services offers you the ability to move seamlessly from choosing your products to having them fitted according to your design. All our bathroom and kitchen fitters are fully qualified and meet the high standard of workmanship that we uphold. We continue to offer friendly support and guidance as the installation progresses to ensure your bathroom or kitchen transformation is taking shape as you expected. Easily design and buy your beautiful bathroom with the help of our simple to use and free online bathroom planning tool. 1. Measure your bathroom to get the exact dimensions of your room, windows and doors. 2. Browse from our entire bathroom range and instantly add into your design.